The work 'Cosmic Egg' was created shortly following the birth of my first child and while I was pregnant with the second. 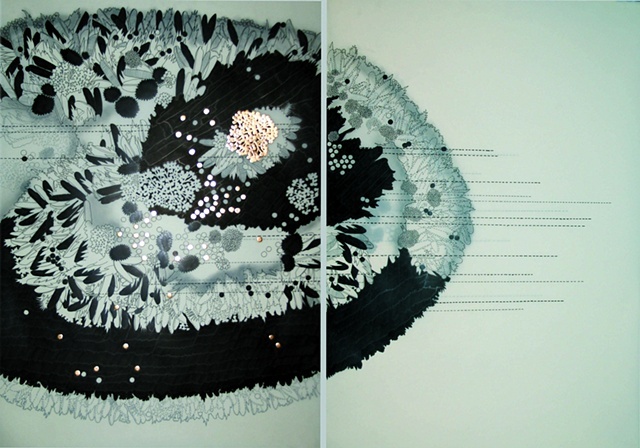 The work explores the wondrous connection between the origins of the human body and the environment. I have often made works that examine the (female) body and form as a metaphor for land/earth- where the body is nurtured, plundered and desecrated, so is the earth. Cultures and civilizations across the world have used the cosmic egg as a mythical motif symbolic of creation and the origins of life. As an artist and a young mother, I am very drawn to this symbolism and the interconnectedness between the mythical and the actual.